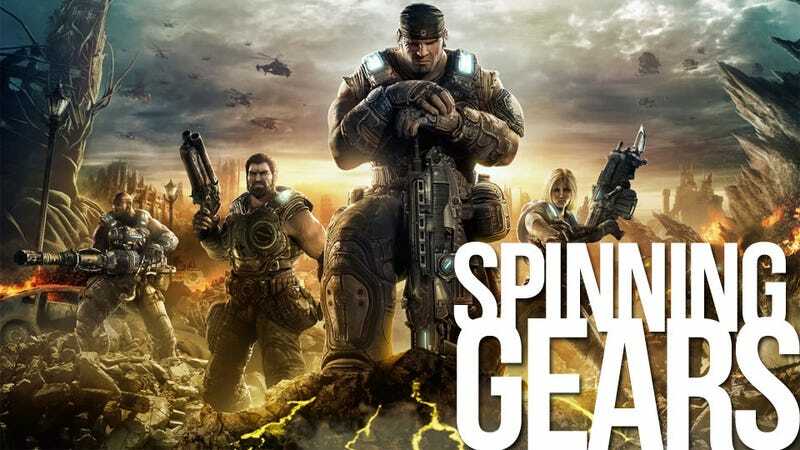 In 2006 when science fiction author Karen Traviss’ editor asked her if she wanted to do a military video game tie-in novel, it was the first she’d heard of Epic Games’ Gears of War. Today she’s responsible for the entire fictional universe, steering the adventure of Marcus Fenix and company to its inevitable conclusion and beyond. Kotaku recently spoke to the award-winning author about fleshing out the world of the epic video game franchise. A former television and newspaper reporter , Traviss made a name for herself in science fiction circles with her original Wess’har series of novels as well as the much-loved Star Wars spinoff series, Republic Commando. Traviss is a highly visual storyteller, fully capable of transporting the reader to the front lines of a massive war on an alien world, but it’s her work in the trenches that’s always impressed me, developing the personalities and depicting the personal relationships between soldiers in battle, breathing life into what otherwise might have been a handful of plastic action figures. And now it’s Traviss Universe, and that’s not a responsibility the writer takes lightly. She writes the novels. Last year she took over writing duties on the ongoing comic book series. She once even wrote some text for the packaging for the Gears of War action figures. This is not a woman that delegates. This wasn’t a case of the game creators hiring a writer to come in and clean things up. I inherited the levels because the environments had been built, but this was a game series with a solid story structure from the start, so it wasn’t what (Heavenly Sword and Mirror’s Edge scribe) Rhianna Pratchett so aptly calls ‘narrative paramedic’ work,” Traviss explained. “It fitted the story arc, so it was a matter of fleshing it and tuning it to the fine detail of the game story. Traviss’ involvement in Gears of War 3 goes far beyond writing the story proper. “The game was a great deal more than writing a pile of scripts,” she told me, explaining how she developed storytelling devices for the game’s environments and wrote up the game’s collectibles. She tailored the banter between characters to suit the story and specific situations, sitting in on the “hilarious” voice capture sessions. She even worked with cinematics director Greg Mitchell (“the Brilliant Greg Mitchell”), on the visuals, briefing the motion capture actors. Karen Traviss – Karen Traviss can often be found staring over the top of a laptop, especially in Google image search. That television background proved to be the steepest learning curve for Traviss in transitioning to video game writing. Television programming tells a story in a linear fashion, leading the viewer through the process. Television writers have control over the pace in which their product is consumed. They know when the important plot beats can hit; they shape the viewer experience. A video game writer must take a different approach. “Pacing doesn’t exist — the player consumes in chunks, sometimes weeks apart, so each element, be it cinematic or gameplay, has to both stand on its own to keep the interest going, and also become parts of a larger, holistic process to convey a story arc,” she explained. Karen Traviss’ involvement with Gears of War 3 ended a little over a year ago, when the game went into the technical polish stage. “Then I got some sleep,” she joked, but her journey through the Gears universe is far from over. There’s a fifth book, Gears of War: The Slab, due out next year, telling the story of Marcus Fenix’s time in in the Jacinto Maximum Security Prison. Then there’s the comic book series, and whatever action figures might be coming out (they need writing too!). She’s even got a series of Halo novels in the works. Trouble is, nobody buys a game because of who the writer is. As for video games themselves, Karen Traviss absolutely loves writing them (almost as much as comic books), while remaining wary of the delicate balancing act committing to such a monumental task presents to a writer with her own career and fan base. Without the royalties or residuals that come from writing for other media, it makes hunkering down for a major game project a risk, one that can be balanced by the increased profile that might come from working on a successful game. I’ll be picking up Gears of War 3 on September 20, and Karen Traviss is my primary motivation for doing so.